This still life tapestry of flowers "Oval Still Life Black" shows a bouquet in a dark background. Surrounded by a golden border filled with intricate details of flowers, this piece shows the Belgian love of flowers as still life subjects. 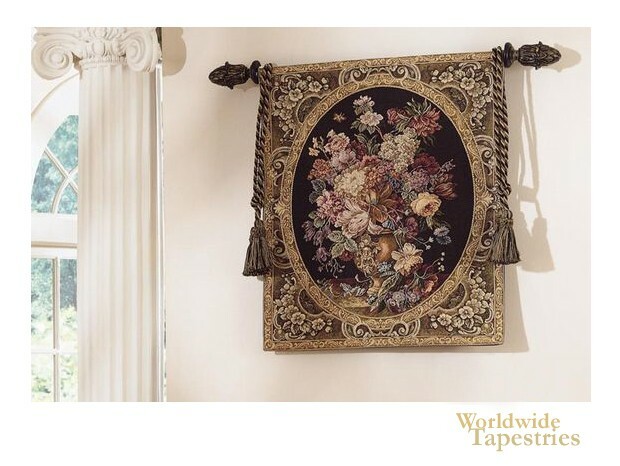 This floral Belgian tapestry "Oval Still Life Black" is backed with a lining and has a tunnel for easy hanging. Note: tapestry rod and tassels, where pictured, are not included in the price. Dimensions: W 26" x H 30"